The Keller Williams Family Reunion is the industry’s most powerful training event. Agents from all over the world have the opportunity to gather with thousands of top associates for four days to network, re-energize and take your business to the next level. There are countless number of ways that you can learn and grow with Keller Williams, and they are all highlighted at the annual Family Reunion event. Any agent who has never been should definitely take time off to attend this unprecedented gathering of information, talent and agents to see how much they can grow and develop their own real estate career. The fact is, Family Reunion is one of the few times each year that you will be able to experience educational events and training from those who have already achieved success in their careers in mass quantities (close to 15,ooo KW associates will attend!). You can gain motivation, network with other agents, and learn about yourself and the career you want to have. We have the tools necessary to build the business that you want to build. The training and business model are near perfect, we just need you to implement the systems. Once you see how other agents are achieving the success you desire, you’ll be quick to implement the Keller Williams business model. 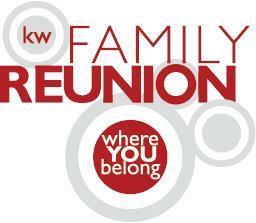 If you are interested in what the Keller Williams Family Reunion has to offer you, you need to join us today. The success by design that you can build is highlighted by this annual event that provides you with unprecedented seminars and meetings that will teach you how to make the most of your career. You will learn trusted and true secrets that never change as well as new trends and technology that will guide you into the future.